Executive vice president Rick Mills, assistant vice president for finance Tricia Spellman and chief financial officer Mike Wagner hosted the presentation, which introduced Dartmouth’s organizational structure, revenue streams, expenses, tuition and financial aid calculations, and endowment. Roughly two dozen students and community members attended the presentation, which took place in House Center B. The session was a preview for the spring term mini-series of the same name, which for five years has taken an in-depth look at Dartmouth’s finances. Open to students, faculty and staff, the course consists of five or six two-hour sessions that “provide an insider’s perspective on higher education finance and Dartmouth’s budget planning,” according to slides shown during Tuesday’s presentation. The goal of this session was to provide an introduction to topics covered in the spring mini-course and solicit student input about the most engaging format for the course going forward. Rik Abels ’21 said he attended the event because he is interested in higher education finance and hopes to learn more about it. Wagner began the presentation by describing Dartmouth’s organizational structure in the 2017 fiscal year. Dominating the budget, he noted, was the nearly $600 million allotment for the College of Arts and Sciences, graduate program entities and central functioning of the College, which includes areas such as Campus Services, the Office of the President and the library system. This dwarfed the budgets for the Geisel School of Medicine, the Thayer School of Engineering, the Tuck School of Business and “auxiliaries” — such as college-owned businesses like the Hanover Inn, Dartmouth Dining Services and the Dartmouth Skiway — which, according to Mills, demonstrates the College’s prioritizing of undergraduate learning. According to Wagner, students are typically surprised that only 24 percent of revenue comes in through “tuition and fees.” The endowment distribution, sponsored research, “current use gifts” — which are donations to the College’s annual fund to support annual expenditures, as opposed to donations to the endowment — and other sources round out the rest. In particular, the large portion that comes from current use gifts compared to other colleges and universities shows the loyalty of Dartmouth alumni, Wagner said. In the “average cost per undergraduate student” section of the presentation, Wagner said that on average, Dartmouth spends $133,668 on one year of education for one student, only $68,109 of which is covered by tuition and mandatory fees. The other $65,559 is covered by other revenue, mainly the endowment distribution and current use gifts. Wagner added that this number can be misleading. Wagner noted that lab courses, theatre and athletics facilities are particularly expensive. The $130,000 price tag seemed to stick with audience members. “I think that was interesting just because they’re spending almost twice as much per student as [students pay in] their tuition … so I thought that was pretty cool,” Gaurav Varma ’20 said. The statistic also resonated with Camille Pauley ’21, who attended the presentation because she is involved with the Divest Dartmouth group, which advocates for the College’s divestment from fossil fuels. Mills and Wagner also discussed several reasons why Dartmouth’s cost per student is as high as it is, citing location, economies of scale and increased access to undergraduate research. Dartmouth has to pay more for large quantities of food and for construction companies based in Boston, even as it saves money on land in rural Hanover, Mills said. Additionally, because the price of a stadium or another athletic facility, for example, is relatively fixed, but Dartmouth’s overall student population is smaller than many peer institutions, those costs are distributed among fewer students, driving up the per-student number. Additionally, most peer institutions do not sponsor undergraduate research to the same extent that Dartmouth does, according to Mills and Wagner. 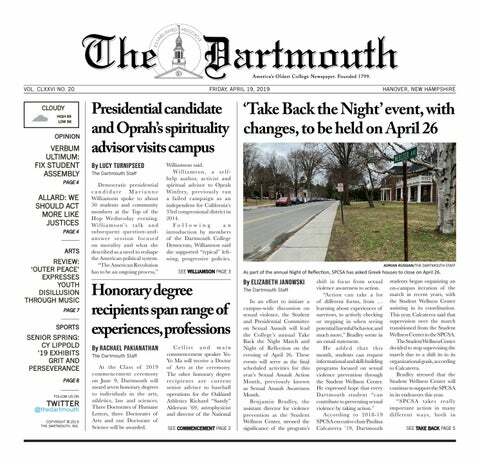 “We can’t spend all of that money in one year — or five years — because it’s intended to be for the eternity of Dartmouth,” Wagner said. Mills noted the College must also consider the fact that certain contributions are intended for specific programs.